Teda Gate and Pawalgarh Tourism Zone Sitabani Forest Zone:- Sitabani is a hard forest area. Not a part of the Corbett Tiger Reserve, but is the only spot for bird watching in Jim Corbett. The area is a favourite spot for tourists walking by and is popular because of its mention in the Hindu epic, Ramayana. The legend says that goddess Sita, wife of Lord Rama, spent some days of her exile in Sitabani. The entire place is protected and maintained by Archaeological Survey of India (ASI). Whole of forest area in Sitabani is open all round the year for safari tours and there is absolutely no limit of vehicles entering the area. Corbett national park authority does not offer the permit for the entry into this zone. Instead, Sitabani Forest Department provides the permit for jeep safari in this region. Sitabani forest zone also has a popular temple which is dedicated to Lord Shiva. There are shallow brooks flowing through the Sitabani, which offer enjoyable retreats to the tourists passing by. Tourists can also catch fishes and get excited about angling. It would indeed be a great idea to take a tour round this zone and get a real time glimpse of it. Since you can easily take a walk through the Sitabani region, it would become a memorable adventure for you. Sitabani is one of the prominent zones which are always full with tourists. Most of the tourists entering Sitabani Gypsy Safari zone are avid bird watchers. They have fair inkling to watch birds and the best part is that there are plenty of birds to watch around, all through the season. Tourists can also take a glimpse of vultures, which have almost disappeared from the cities and towns. Flora & Fauna:- Sitabani forest zone is very popular for its rich diversity of flora. There are more than 600 species of trees, shrubs, bamboos, herbs, grasses, orchids, woody climbers and wetland vegetation. Some of the most important evergreen flora of this zone are Sal, Sheesham, Kanju, Dhak, Haldu, Pipal, Mangos and Rohini trees. Besides all these, Sitabani is indeed a fabulous spot and natural habitat for tigers, elephants, deers, sambhars, barking deers, porcupines, and king cobras. The place is a paradise for bird watchers and there is also an ashram where tourists can take rest for a while. 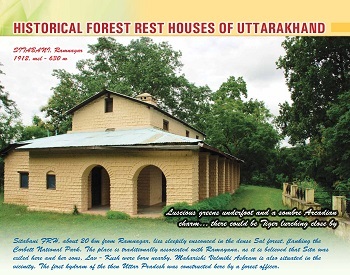 Accommodation in Sitabani Forest Zone:- There is accommodation available for tourists in this zone. Best Time to Visit:- 15 October to 30 June. How to Book:- There is advance booking and permit for Sitabani forest zone. Corbett Tiger reserve rule regulations apply in this zone.